To celebrate Australia Day, the Governor of Victoria invites all citizens of Victoria and visitors to the State to visit Government House, one of Australia's finest buildings on Australia Day. Explore one of Australia's finest historic buildings and grounds, open to the public for free. Members of the public are welcome to view the State Apartments and Grounds between 9.30 am and 3.00 pm. Self-guided tours of the State Apartments commence at 10.00 am and will conclude at 3.00 pm. The Governor is a patron of a number of community organisations and several of these (along with other community groups) are participating in the Government House Open Day, offering free activities for visitors. 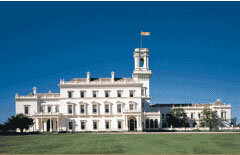 Please note queues are expected to form for entry into Government House. Queues will be entertained by a range of roving performers. There will be no vehicle access to Government House. Visitors are encouraged to use public transport to access the precinct. There is ease of access for people with disabilities and parking is available on Birdwood Ave and St Kilda Rd.